It’s been a while since we reviewed a cooperative game here, and as you know we do love coops. So, when Matt Leacock has a new (not quite so new any more, but still fairly new) game in the market, we naturally want to check it out. Forbidden Island has a lot to live up to, Pandemic was after all one of cooperative gaming’s greatest hits. The setting of Forbidden Island couldn’t be more different from Pandemic. There is nothing here about curing diseases and saving mankind, this is a mad adventure in pursuit of wealth and power. The players, a team of adventurers, explorers and general Indiana Jones types, are in search of four mighty artefacts the ancient Archaean empire hid away on the island, afraid of the destruction they might cause in the wrong hands: the Crystal of Fire, the Statue of the Wind, the Ocean’s Chalice and the Earth Stone. The island is randomly assembled from 24 tiles before the game starts, and always takes a diamond shape: a square of 4×4 tiles, then two more tiles in the centre of each side. All tiles present a completely different environment – the diversity of this small island is remarkable, I’m afraid to ask what kinds of animals would live there – and all of them are beautifully painted. It’s almost a shame that you will only care about nine of those: Fool’s Landing, the heliport where the adventurers arrive, and two locations where each of the artefacts can be retrieved. Expedition Diary, Day 2: The Archaeans were ingenious engineers. Nothing ever indicated this to be anything but a normal island, yet within a day of our arrival we discovered that the whole thing must be some sort of elaborate machinery. We had just set out, looking for clues about the elemental artefacts, when the ground started moving. Parts of the island – undisturbed for god knows how long – started sinking. Engineer Dufrey is working on a system to stabilise everything long enough for us to find what we’re looking for. Finding four powerful artefacts on a deserted island should be easy money. But the whole island is slowly sinking to the bottom of the ocean. Sinking is a two-step process: each tile has a coloured front that it shows when it is completely above water. When it gets flooded, it’s turned over to the white and blue backside. And then, when it gets flooded more, it is removed from the game, leaving nothing but the endless depths of the ocean and a gap in the island grid. The game starts with six tiles already flooded, determined by drawing cards from the Flood Deck. Every card is in the flood deck only once, so at least for now, you don’t have to worry about completely losing a tile. 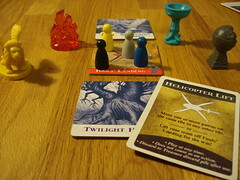 The players do not face this situation entirely unprepared: the team of adventurers was hand-picked to have the skills for the job – not really, they were actually randomly from a deck of role cards. Each role has a special ability they can use on their turn, and using these special abilities at the right time is essential to win Forbidden Island. Special abilities include special movement rules, card trading rules and the ability to safe flooded tiles more efficiently. 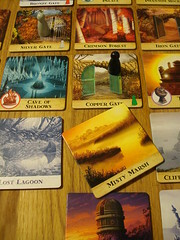 Each player also starts with two treasure cards. To retrieve an artefact from it’s hiding place, four cards of that kind are needed, and just to make communication easier the cards are visible to all players. A turn on Forbidden Island will immediately feel familiar to Pandemic veterans. Matt wisely decided not to change a good system, so the basic turn structure is exactly the same. Move: move one tile horizontally or vertically. Movement has the most special abilities attached to it. The Explorer may move diagonally, the Pilot may move to any tile once per turn, the Navigator may move another meeple by 2 tiles for one action and the Diver may move through any number of flooded or sunken tiles for one action. Shore Up: I have no idea how this would work, but for one action, you can safe the tile your on or an adjacent tile from sinking. Turn any flooded tile to the unflooded side again. Must be some ancient Archaean technology at work here. The Engineer understands this technology best, so he can unflood two tiles for one action. Give away a Treasure Card: For one action, you can give away one of your treasure card to another player on the same tile. The Messenger, master of the carrier pigeon, can give a card to another player anywhere on the island. This action differs slightly from Pandemic, leading to us playing it wrong for the first two games – skipping a section of the rules because “yeah, we know how this works” is never a good idea. Cards can only be given away on your turn, not taken, not traded. So if you give a card to another player, he may have to discard another one due to the 5 card hand limit. Capture a Treasure: With four treasure cards of the right kind, standing on one of the two tiles that can have that artefact, you can unearth it . After taking your three actions, you draw 2 treasure cards. Most of the treasure cards are just standard artefact cards that you use as described above. There is three other kinds of cards in that deck, two that you will be very happy to see, and one that … well, not so much. The two cards you will be happy about are the special action cards: Helicopter Lift and Sandbags. The Helicopter takes all the meeple from one tile to another, Sandbags immediately shore up one tile. Special actions can be played at any time, even outside your own turn. The one kind of card that will not make you happy is Waters Rise! – the Epidemic! of insular devastation. Just like it’s ancestor from Pandemic, Waters Rise! makes you shuffle the discard pile of the flood deck and put it back on top – making all the tiles that were already flooded come around again and increase the number of flood cards drawn every turn. Speaking of flood cards: after the treasure cards, it’s time to sink the island. You draw flood cards equal to the water level – between two and five – and sink those tiles. If they were sunny side up before, you turn them to the flooded side, if they were flooded already they sink. A meeple standing on a sinking tile is not lost, he can still swim to an adjacent tile. If there is no adjacent tile left (and he is not the Diver, who can go further under water), the meeple and the game are lost. When a tile sinks, the card is also removed from the flood deck, so letting some tiles sink on purpose does not slow down the sinking of the island. Whenever the flood pile runs out of cards, you immediately shuffle the discard and keep drawing. This happens more often than you may think now: towards the end of the game, it’s not unusual to only have four or five tiles left, so the flood pile is used up at least for every other player and the same cards just keep coming. Expedition Diary, Day 8: The expedition is not going well. Yesterday, we lost most of the east part of the island. The Temple of the Moon, our only remaining chance to find the Earth Stone, is completely isolated from the rest of the island now, and we find ourselves without diving gear. Messenger Smith just send me the one clue I was missing to recover the artefact. I will take the helicopter to go to the flooded temple alone, and pray to god it doesn’t sink before I can make my way back. both tiles where you can find one artefact sink before you have the artefact. the water level reaches the skull and crossbones, beyond the five card mark. On the other hand, you only win by discovering all four artefacts, getting all your adventurers back to Fool’s Landing and then playing a Helicopter Lift to escape the island. I’ll be honest, when I read through the rules I thought Forbidden Island was too similar to Pandemic to own both of them, but I’m now happy to report that I was wrong. The core mechanics may be the same, but the feeling of the game is very different. The most noticeable difference, at least for me, is one of scale. Pandemic makes you travel all over the world, and you can get where you need to be in one turn. Forbidden Island, on the other hand, covers a small island, and you can not reach the other end of it in one turn without using special abilities. The special abilities are also tuned down in Forbidden Island. Using them is still important for winning the game, but their effect is smaller than it was in Pandemic. This also means that the selection of roles has less effect on the difficulty of the game (*cough* Dispatcher *cough*). The final, and maybe most important, difference is the escalation mechanic. Escalation is, to me, the core quality of a cooperative game. In the beginning, everything looks easy and manageable, and with every passing turn you are more in doubt if you actually win this game. In Pandemic, the area you need to consider grows during the game. As diseases spread and more popped up, the main problem becomes where to go and act first. Forbidden Island is the exact opposite of that: the area inevitably grows smaller, and instead of being torn between different places to safe, your decision becomes only in what order you do things to keep the island afloat for one more round. 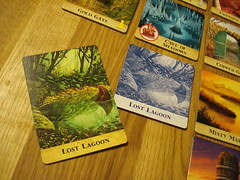 The end is almost claustrophobic, you are desperately trying to keep the remaining three tiles above water so the player with four matching cards can have one more turn to pick up the last artefact.The end of Forbidden Island is a very tense affair, and if you don’t set the starting difficulty to low you will barely escape the island with your treasures before it sinks under the waves. 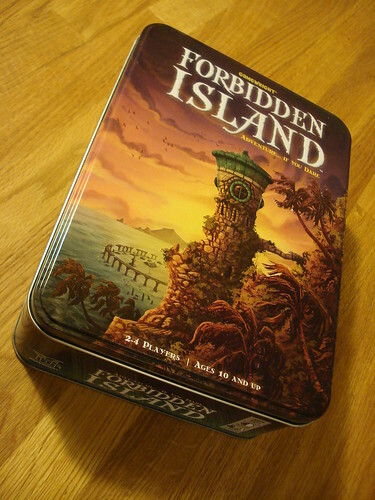 Forbidden Island is, on top of being tense and entertaining, a beautiful game. The artwork on the cards is stylish and in line with the theme – think 1960s pulp adventure novel. The four artefacts are present as plastic miniatures, just to have something to pick up when succeed in recovering one. And at least in our edition, the metal box with full colour print and relief lid, it’s worth keeping it were people can see it. If you force me to make a final decision between Pandemic and Forbidden Island, I wouldn’t. Despite their similarities, both games are fun in their own way, and Forbidden Island has more than enough charm to be Forbidden Island instead of Pandemic’s Little Brother. Expedition Diary, Day 12: We escaped the Island, with all four artefacts claimed. Still, our mission was anything but a success. Engineer Dufrey is no longer with us. He died a hero’s death, keeping Fool’s Landing afloat just long enough for us to escape. When the helicopter was taking off, already knee-deep in water, he came running out of the jungle, the island sinking under him. He gave one last thumb’s up before he disappeared. We lost a good man and a friend, just for a bunch of magic rocks that we don’t even know how to activate. Previous Post:Meople News: Does crushing fingers make me a Cylon?